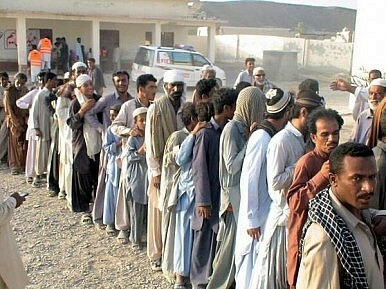 Militants and bad infrastructure have held up relief efforts in Baluchistan after two large earthquakes. Baluchistan, already one of the most neglected and impoverished areas of Pakistan, is now starving for aid, relief and shelter, after two earthquakes hit the Awaran district last week. Last Tuesday a 7.7 magnitude earthquake flattened thousands of homes in Awaran, killing 300, according to figures released by the government. However, some local reporters suggested that there were at least 500 deaths on the ground, extending to areas like Mashkay, Gishkore and Mallar. On Saturday another quake hit southern Awaran, causing at least 30 more deaths. Hundreds of survivors are sleeping in tents with many more left to sleep under the open sky, as they wait for relief, which has been delayed by communication problems in the decrepit district. Without relief or voluntary help, and in the absence of government assistance, in the first few days after the first quake locals tried to pull bodies out from the debris themselves. Women and children survivors also helped to rescue injured victims and pull corpses out from the rubble. Making matters worse, local militants attacked the relief helicopters, adding a security threat to the situation. Hussain added that in a situation this intense, help from the government and army must be more vigilant and should have anticipated the security threat faced by the rescue teams. However, the army said in a public statement on Friday that the militant attacks will not deter their relief work in the earthquake-affected areas of Balochistan. “The security situation is a challenge, but it would not affect relief work which would continue at full pace,” ISPR spokesman Major-General Asim Bajwa said, after consulting with the provincial government following two more attacks by militants on officials trying to reach the ground to help with relief and assessing the damage. In total, more than 650 people have been injured from both the quakes and other subsequent quake-related incidents. While relief efforts have not been smooth, local officials have stepped up efforts in recent days, with chief ministers from Punjab (Shahbaz Sharif) and Sindh (Qaim Ali), among others, pledging financial assistance and relief goods – including more than 20,000 tents, food items, water and medicines – to help Balochistan cope with the aftermath of the earthquake. About 100,000 families have been affected by the quake and about 1,200 troops have been deployed in relief operations. Sources say that an additional 200 soldiers were deployed on Friday to help protect the troops engaged in relief work. “About 11 helicopters have been reserved for carrying out relief sorties as the government is now making arrangements for 25,000 effected families in the area,” an official involved in the effort told The Diplomat. According to some official estimates, around 300,000 victims have been affected by the earthquake in six districts. “Survivors need aid and provisions, including food, water, blankets, tents and medical supplies. There is also an urgent need for doctors and aid workers to volunteer for the emergency situation,” Akram Khan, a local reporter in the area said. To give some sense of the magnitude of the earthquake, an island formed off the nation’s coast near the port of Gwadar in the Arabian Sea. Officials have reportedly said that such land masses have appeared before in the area, but have not remained and usually disappear over time.